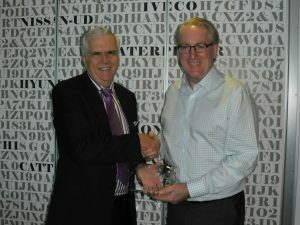 Allan Manning presenting the LMI Claims Services Award to NTI’s CEO, Mr Tony Clark (right). One of the joys of my role is to deliver the LMI Claims Service Award to acknowledge great claims service. Last week I had the privilege of presenting the award to Mr Tony Clark the CEO of NTI Insurance. NTI were the only Commercial Motor insurer to achieve a 5 star claims rating on LMI ClaimsComparison.com. The whole idea behind the award is to acknowledge those claims teams that provide the highest level of service. At the end of the day, insurance is a promise. A promise to look after the Insured should they have a claim and/or suffer financial loss. In my experience, having handled claims for over 45 years now, is that few people remember the price of insurance when a claim occurs. Most if not all want the very best claims service and a fair deal. When your truck is your livelihood, having a quality commercial motor insurance is extremely important. While some insurers pride themselves on their customer service and actively look for ways to pay your claim, others seem to look to deny the claim and appear to be thinking more of their bottom line, than their customers’ well-being. In the case of NTI, they achieved a very high rating based on the fact that they get their Insured’s vehicles back on the road faster and with less fuss than any other insurer. Well done to all the NTI and in particular to their claims team. On the subject of claims, another reason for the award is that there is far too little opportunities for claims personnel to be acknowledged for the great work they do for our industry and for their own company’s. This award is a reminder of the importance of claims and those that work in this field which is the backbone of the insurance industry. It will be interesting to see the ratings develop over time. Well done and well done to NTI.